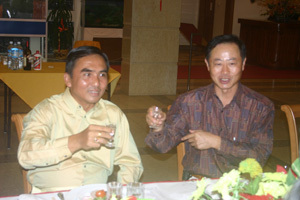 On the evening of 18 April 2005, Ambassador Li Jinjun held dinner at his residence in honour of the Commander-in-Chief of Myanmar Air Force Lt-Gen. Myat Hein and party to visit China soon. Brig-Gen. Zaw Htun, Commander of Myitkyina Air Base together with other members of the delegation, Colonel General Staff (MA) Colonel Nay Win and other senior officers attended the dinner. 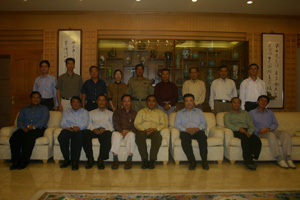 During the dinner, Lt-Gen. Myat Hein happily recalled the pleasant times when he conducted visits and attended courses in China in the past, sang high praise for the traditional friendship between the two countries and armed forces and highly appreciated the great progress and achievement China has made after taking the opening and reform policy. 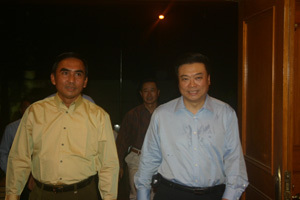 And thus, Lt-Gen. Myat Hein held very high expectations for the coming visit. Ambassador Li Jinjun said that in recent years leaders of the two countries and armed forces frequently exchanged visits, which played vital important role in pushing forward the development of the relationship between the two countries and armed forces, and he was confident that Lt-Gen. Myat Hein's visit would further enhance the friendly cooperations between the two sides. Ambassador Li Jinjun sincerely wished the visit smooth and success. The guests and hosts had warm discussions and wished the friendship between the two countries and armed forces will last forever. Counsellor Yu Boren, Defense Attaché Senior Colonel Ma Shoudong and the officials concerned of the embassy also attended the dinner.